An adaptive optics visual simulator (AOVS) with an extended dioptric range was developed, allowing measuring and correcting aberrations in a majority of highly ametropic eyes. In the instrument, a tunable lens is used for defocus correction, while a liquid-crystal-on-silicon spatial light modulator is used for compensating or inducing any other aberration. The instrument incorporates a digital projector, which uses a micromirror array to display the stimuli. A motorized diaphragm enables operation for any physiological pupil size. A full description of the instrument and its calibration are provided, together with the results obtained in seven highly myopic subjects with refraction of −7.2±1.8 D (mean±SD). Refraction obtained with the instrument was compared to the standard refraction prescribed by trial lenses. When using the refraction obtained by the AOVS, the visual acuity (VA) exhibited an average increase of 0.21 (decimal scale). The visual impact of correcting high-order aberrations is presented in three subjects, whose VAs slightly improved with the correction. High myopes are able to benefit from the improved refraction assessment. The new instrument creates a possibility for a wide number of new experiments, especially for eyes exhibiting large refractive errors, where previous AO instruments failed to operate. K. Rose, W. Smith, I. Morgan, and P. Mitchell, “The increasing prevalence of myopia: implications for Australia,” Clin. Exp. Ophthalmol. 29, 116–120 (2001). C.-W. Pan, M. Dirani, C.-Y. Cheng, T.-Y. Wong, and S.-M. Saw, “The age-specific prevalence of myopia in Asia: a meta-analysis,” Optom. Vis. Sci. 92, 258–266 (2015). B. A. Holden, T. R. Fricke, D. A. Wilson, M. Jong, K. S. Naidoo, P. Sankaridurg, T. Y. Wong, T. J. Naduvilath, and S. Resnikoff, “Global prevalence of myopia and high myopia and temporal trends from 2000 through 2050,” Ophthalmology 123, 1036–1042 (2016). J. Liang, B. Grimm, S. Goelz, and J. F. Bille, “Objective measurement of wave aberrations of the human eye with the use of a Hartmann-Shack wave-front sensor,” J. Opt. Soc. Am. A 11, 1949–1957 (1994). J. Liang and D. R. Williams, “Aberrations and retinal image quality of the normal human eye,” J. Opt. Soc. Am. A 14, 2873–2883 (1997). P. M. Prieto, F. Vargas-Martn, S. Goelz, and P. Artal, “Analysis of the performance of the Hartmann-Shack sensor in the human eye,” J. Opt. Soc. Am. A 17, 1388–1398 (2000). J. Porter, A. Guirao, I. G. Cox, and D. R. Williams, “Monochromatic aberrations of the human eye in a large population,” J. Opt. Soc. Am. A 18, 1793–1803 (2001). H. Hofer, P. Artal, B. Singer, J. L. Aragón, and D. R. Williams, “Dynamics of the eye’s wave aberration,” J. Opt. Soc. Am. A 18, 497–506 (2001). M. P. Cagigal, V. F. Canales, J. F. Castejón-Mochón, P. M. Prieto, N. López-Gil, and P. Artal, “Statistical description of wave-front aberration in the human eye,” Opt. Lett. 27, 37–39 (2002). L. N. Thibos, X. Hong, A. Bradley, and X. Cheng, “Statistical variation of aberration structure and image quality in a normal population of healthy eyes,” J. Opt. Soc. Am. A 19, 2329–2348 (2002). A. Mira-Agudelo, L. Lundström, and P. Artal, “Temporal dynamics of ocular aberrations: monocular vs binocular vision,” Ophthalmic Physiolog. Opt. 29, 256–263 (2009). E. Chirre, P. M. Prieto, and P. Artal, “Binocular open-view instrument to measure aberrations and pupillary dynamics,” Opt. Lett. 39, 4773–4775 (2014). H. Hofer, L. Chen, G. Y. Yoon, B. Singer, Y. Yamauchi, and D. R. Williams, “Improvement in retinal image quality with dynamic correction of the eye’s aberrations,” Opt. Express 8, 631–643(2001). N. Doble, G. Yoon, L. Chen, P. Bierden, B. Singer, S. Olivier, and D. R. Williams, “Use of a microelectromechanical mirror for adaptive optics in the human eye,” Opt. Lett. 27, 1537–1539 (2002). E. J. Fernández and P. Artal, “Membrane deformable mirror for adaptive optics: performance limits in visual optics,” Opt. Express 11, 1056–1069 (2003). D. T. Miller, L. N. Thibos, and X. Hong, “Requirements for segmented correctors for diffraction-limited performance in the human eye,” Opt. Express 13, 275–289 (2005). E. Dalimier and C. Dainty, “Comparative analysis of deformable mirrors for ocular adaptive optics,” Opt. Express 13, 4275–4285 (2005). E. J. Fernández, A. Unterhuber, B. Považay, B. Hermann, P. Artal, and W. Drexler, “Chromatic aberration correction of the human eye for retinal imaging in the near infrared,” Opt. Express 14, 6213–6225 (2006). E. J. Fernández and P. Artal, “Ocular aberrations up to the infrared range: from 6328 to 1070 nm,” Opt. Express 16, 21199–21208 (2008). E. J. Fernández, P. M. Prieto, and P. Artal, “Binocular adaptive optics visual simulator,” Opt. Lett. 34, 2628–2630 (2009). P. A. Piers, N. E. Sverker Norrby, and U. Mester, “Eye models for the prediction of contrast vision in patients with new intraocular lens designs,” Opt. Lett. 29, 733–735 (2004). 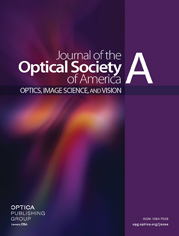 S. Manzanera, P. M. Prieto, D. B. Ayala, J. M. Lindacher, and P. Artal, “Liquid crystal adaptive optics visual simulator: application to testing and design of ophthalmic optical elements,” Opt. Express 15, 16177–16188 (2007). C. Cánovas, P. M. Prieto, S. Manzanera, A. Mira, and P. Artal, “Hybrid adaptive-optics visual simulator,” Opt. Lett. 35, 196–198 (2010). P. Artal, L. Chen, E. J. Fernández, B. Singer, S. Manzanera, and D. R. Williams, “Neural compensation for the eye’s optical aberrations,” J. Vis. 4(4), 281–287 (2004). E. J. Fernández, A. Unterhuber, P. M. Prieto, B. Hermann, W. Drexler, and P. Artal, “Ocular aberrations as a function of wavelength in the near infrared measured with a femtosecond laser,” Opt. Express 13, 400–409 (2005). P. A. Piers, S. Manzanera, P. M. Prieto, N. Gorceix, and P. Artal, “Use of adaptive optics to determine the optimal ocular spherical aberration,” J. Cataract Refractive Surg. 33, 1721–1726 (2007). L. Lundström, S. Manzanera, P. M. Prieto, D. B. Ayala, N. Gorceix, J. Gustafsson, P. Unsbo, and P. Artal, “Effect of optical correction and remaining aberrations on peripheral resolution acuity in the human eye,” Opt. Express 15, 12654–12661 (2007). P. Artal, S. Manzanera, P. Piers, and H. Weeber, “Visual effect of the combined correction of spherical and longitudinal chromatic aberrations,” Opt. Express 18, 1637–1648 (2010). E. J. Fernández, P. M. Prieto, and P. Artal, “Adaptive optics binocular visual simulator to study stereopsis in the presence of aberrations,” J. Opt. Soc. Am. A 27, A48–A55 (2010). E. J. Fernández, “Adaptive optics for visual simulation,” ISRN Opt. 2012, 1–13 (2012). E. A. Villegas, E. Alcón, S. Mirabet, I. Yago, J. M. Marín, and P. Artal, “Extended depth of focus with induced spherical aberration in light-adjustable intraocular lenses,” Am. J. Ophthalmol. 157, 142–149 (2014). S. Manzanera and P. Artal, “Minimum change in spherical aberration that can be perceived,” Biomed. Opt. Express 7, 3471–3477(2016). E. J. Fernández, P. M. Prieto, and P. Artal, “Wave-aberration control with a liquid crystal on silicon (LCOS) spatial phase modulator,” Opt. Express 17, 11013–11025 (2009). F. Vargas-Martn, P. M. Prieto, and P. Artal, “Correction of the aberrations in the human eye with a liquid-crystal spatial light modulator: limits to performance,” J. Opt. Soc. Am. A 15, 2552–2562 (1998). P. M. Prieto, E. J. Fernández, S. Manzanera, and P. Artal, “Adaptive optics with a programmable phase modulator: applications in the human eye,” Opt. Express 12, 4059–4071 (2004). J. Primot, “Theoretical description of Shack-Hartmann wave-front sensor,” Opt. Commun. 222, 81–92 (2003). E. J. Fernández and P. Artal, “Study on the effects of monochromatic aberrations in the accommodation response by using adaptive optics,” J. Opt. Soc. Am. A 22, 1732–1738 (2005). B. Wang and K. J. Ciuffreda, “Depth-of-focus of the human eye: theory and clinical implications,” Surv. Ophthalmol. 51, 75–85 (2006). T. O. Salmon and C. van de Pol, “Normal-eye Zernike coefficients and root-mean-square wavefront errors,” J. Cataract Refractive Surg. 32, 2064–2074 (2006). J. L. M. Fuentes, E. J. Fernández, P. M. Prieto, and P. Artal, “Interferometric method for phase calibration in liquid crystal spatial light modulators using a self-generated diffraction-grating,” Opt. Express 24, 14159–14171 (2016). M. Bach, “The Freiburg visual acuity test–automatic measurement of visual acuity,” Optometry Vis. Sci. 73, 49–53 (1996). A. Dehnert, M. Bach, and S. P. Heinrich, “Subjective visual acuity with simulated defocus,” Ophthalmic Physiolog. Opt. 31, 625–631 (2011). E. A. Rossi, P. Weiser, J. Tarrant, and A. Roorda, “Visual performance in emmetropia and low myopia after correction of high-order aberrations,” J. Vis. 7(8), 14 (2007). X. Cheng, A. Bradley, X. Hong, and L. N. Thibos, “Relationship between refractive error and monochromatic aberrations of the eye,” Optometry Vis. Sci. 80, 43–49 (2003). M. P. Paquin, H. Hamam, and P. Simonet, “Objective measurement of optical aberrations in myopic eyes,” Optometry Vis. Sci. 79, 285–291 (2002). J. C. He, P. Sun, R. Held, F. Thorn, X. Sun, and J. E. Gwiazda, “Wavefront aberrations in eyes of emmetropic and moderately myopic school children and young adults,” Vis. Res. 42, 1063–1070 (2002). M. J. Collins, C. F. Wildsoet, and D. A. Atchison, “Monochromatic aberrations and myopia,” Vis. Res. 35, 1157–1163 (1995). A. Carkeet, H. Dong Luo, L. Tong, S. M. Saw, and D. T. Tan, “Refractive error and monochromatic aberrations in Singaporean children,” Vis. Res. 42, 1809–1824 (2002). C. Dorronsoro, A. Radhakrishnan, J. R. Alonso-Sanz, D. Pascual, M. Velasco-Ocana, P. Perez-Merino, and S. Marcos, “Portable simultaneous vision device to simulate multifocal corrections,” Optica 3, 918–924 (2016). B. F. Grewe, F. F. Voigt, M. van’t Hoff, and F. Helmchen, “Fast two-layer two-photon imaging of neuronal cell populations using an electrically tunable lens,” Biomed. Opt. Express 2, 2035–2046 (2011). I. Grulkowski, S. Manzanera, L. Cwiklinski, F. Sobczuk, K. Karnowski, and P. Artal, “Swept source optical coherence tomography and tunable lens technology for comprehensive imaging and biometry of the whole eye,” Optica 5, 52–59 (2018). World Health Organization–Brien Holden Vision Institute, The Impact of Myopia and High Myopia (2015). J. Collins and L. Carney, “Visual performance in high myopia,” Curr. Eye Res. 9, 217–224 (1990). N. C. Strang, B. Winn, and A. Bradley, “The role of neural and optical factors in limiting visual resolution in myopia,” Vis. Res. 38, 1713–1721 (1998). T. Y. Chui, M. K. Yap, H. H. Chan, and L. N. Thibos, “Retinal stretching limits peripheral visual acuity in myopia,” Vis. Res. 45, 593–605 (2005). N. J. Coletta and T. Watson, “Effect of myopia on visual acuity measured with laser interference fringes,” Vis. Res. 46, 636–651 (2006). Fig. 1. Schematic of the new adaptive optics visual simulator with an extended dioptric range. BS1, BS2, beam splitters; FS, field stop; HM, hot mirror; L1 to L7, achromatic doublets. Figure not to scale. Further description of the elements is provided in the main text. Fig. 2. Hysteresis exhibited by the TL. Maximum difference between different operation sequences reached 1.3 D at − 140 mA . Sequence descriptions can be found in the text. Fig. 3. TL calibration. Left panel: defocus modulation curve for random pattern. Right panel: response of the TL after calibration. See text for more information. Fig. 4. Three states of the TL. Left panel shows lens producing negative power, middle panel zero power, and right panel positive power. The membrane surface of the lens is shown as a dashed line. CG1 and CG2: cover glasses 1 and 2 enclosing the lens. Gray lines: rays propagating through the lens. The angle of refraction is exaggerated for visual clarity. Fig. 5. Zernike polynomials in μm for high-order aberrations (HOA) produced by the TL in OSA ordering for 4.5 mm pupil. Data were averaged from 1000 random defocus values. In the top right corner, the wavefront calculated from the average Zernike polynomial values is shown, scaling from 0 to 2 π . Z7 coefficient corresponds to vertical coma aberration. Fig. 6. LCoS-SLM centering. Left frame: LCoS-SLM is not aligned with the physical pupil (shown as oblique fringes); non-modulated light forms focused image on the detector. Right frame: LCoS pupil (shown as a diffractive lens) perfectly coincides with the physical pupil (shown as dashed circle); 100% of the light is modulated. Fig. 7. Comparison of VA achieved by subjects. Prescribed R x shows VA when correcting prescribed refraction found with trial lenses. Measured R x shows VA when correcting refraction found using the wavefront measurements by AOVS. Error bars show standard deviation. Asterisks mark statistically significant difference ( P < 0.05 ). Fig. 8. Optical quality measurements, with only high-order aberrations included. From left to right: subjects S1, S2, S3. Top row: wavefronts, 2 π wrapped. Bottom row: Point-spread functions (PSFs). Corresponding Strehl ratios are shown in the top left corner of PSF images. Fig. 9. Comparison of achieved VA when correcting only low-order aberrations (trial lenses refraction and AO-guided refraction) and when correcting all Zernike polynomials up to sixth order (AO-guided refraction + HOA). Error bars show standard deviation. Fig. 10. Average RMS wavefront error for seven measured subjects (hollow circle). Error bars indicate standard deviation. Data for normal population (filled rhombus) are taken from a different study .